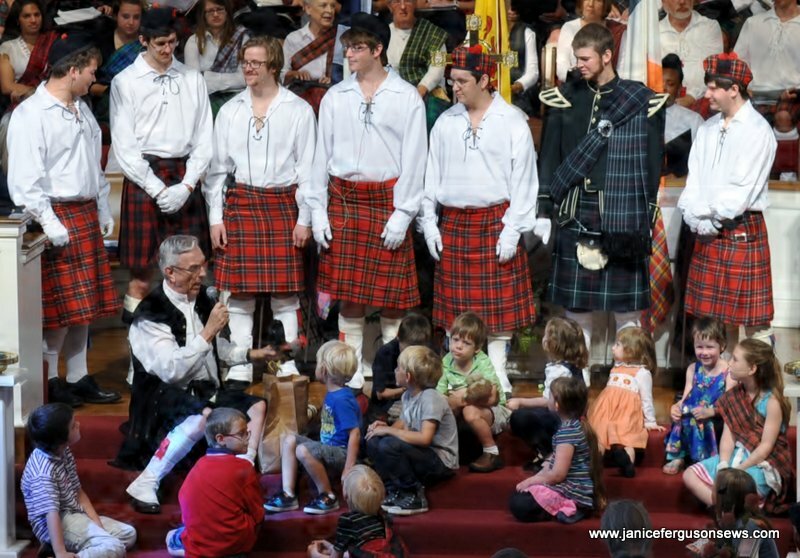 the Re-enactment of the Last Supper, and most recently the Kirkin of the Tartans which celebrated the Scottish ancestry of the Presbyterian church. These kilted men sounded as good as Celtic Thunder on YouTube. The St. Augustine quote, embroidered and framed seemed to be a suitable expression of our gratitude and reminder of his service. In an effort to make certain that the wording was absolutely correct, I googled these words. 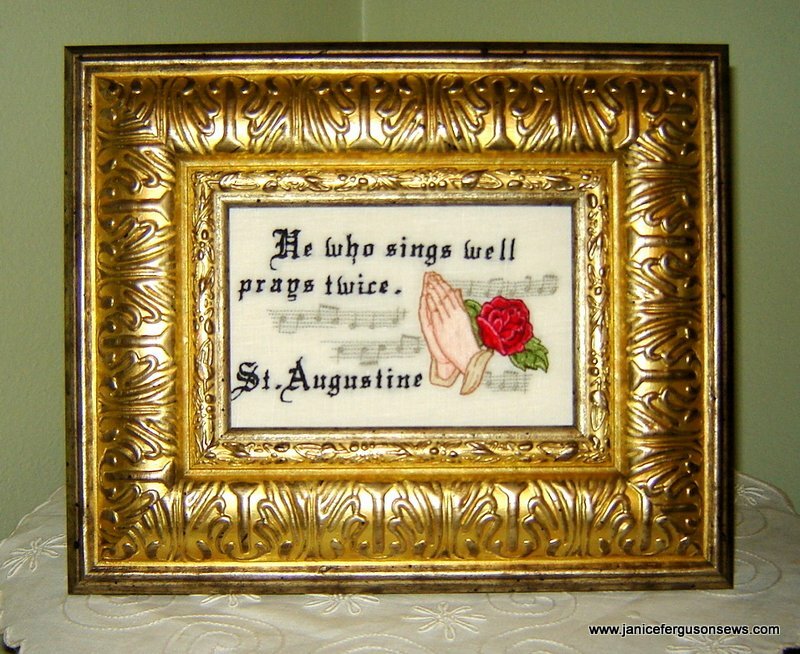 There I found that some scholars believe St. Augustine has been misquoted, and in fact, a more accurate interpretation of his Latin words would be “He who sings WELL prays twice.” So that’s what I embroidered for Fred, because he guaranteed that our choir sang well. The informational article was included with my card of thanks. Laying out the design was a bit of a challenge as the frame I had on hand could only accommodate a 4 x 6″ insert. So it took some fiddling with font size and rearranging the elements to fit. It was stitched on my Brother Quattro in the 5 x 7 hoop. The finished design is 3″ x 5.75″. The text was digitized in PE-Design, then snippets of music were added. Finally, the praying hands from Embroidery Designs.com were added. I love being able to custom make something absolutely unique. Fred received many gifts at his retirement celebration, but I am certain this gift was one-of-a-kind–just like Fred. This would make a nice gift for music teachers and choir directors. If you would like this design, TEXT ONLY, leave your request as a comment. I have put in three color stops for ease in positioning the text to fit whatever additional designs you may want to import. For the celebration of Fred’s retirment, I brought this lemon pound cake. This is a great recipe and it was very well received. I used my square angel food cake pan with the Fostoria square pedestal cake stand. It really did look nice and tasted great. 1 cup unsalted butter at room temp (2 sticks) I just used regular butter. Grease tube or bundt pan. Dust pan with flour; tap out excess. Sift flour, baking soda and salt into medium bowl. Using electric mixer, beat butter in large bowl at medium speed until fluffy. Gradually add sugar and beat 5 minutes. Add eggs 1 at a time, beating just until combined after each egg is added. Beat in lemon juice and peel. Using rubber spatula, mix in dry ingredients. Mix in sour cream. Pour batter to prepared pan – batter will be thick. Bake cake until tester inserted near center comes out clean, about 1 hour 20 minutes. Let cake cool in pan on rack 15 minutes. Cut around cake in pan. Turn out cake. Carefully turn cake right side up on rack and cool completely. For an extra touch – drizzle glaze made of 1 cup confectioners sugar and 2-3 tablespoons of fresh lemon juice over cake. NOTE: I punched holes in the cake with an old 4 prong potato baker and poured the glaze over the cake and into the holes. Also, I added 1 tablespoon of grated lemon peel to the glaze. Then the cake was garnished with twisted lemon slices. This entry was posted in church projects, machine embroidery, recipes and tagged choir embroidery, church embroidery project, embroidery St. Augustine, free machine embroidery design. Bookmark the permalink. Would love to have the sing pray words as I do music at church. I enjoy your blog and projects very much . Thanks for the choir words. Lovely framed piece, Janice…everything you do is pristine! I would love to have the quote to stitch for my DD-I-L who sings like an angel. Well, you got my attention AGAIN! Anything to do with music is all I need to once more be standing here with my hand out to request your generous offer of a copy of the file. Thank you so much. I too have been involved in church music since I was 9 yrs old (as an organist and pianist) so the idea of stitching this has my creative juices flowing! You are a genius!!! absolutely…..no doubt about it! Thank you for your willingness to share with those of us whose mind does not work this way! I love this saying and the way you digitized it. I’d love to have it if you don’t mind. Mary, the design has been sent. Thanks for contributing to the music at your church. Grammie, the design has been sent. 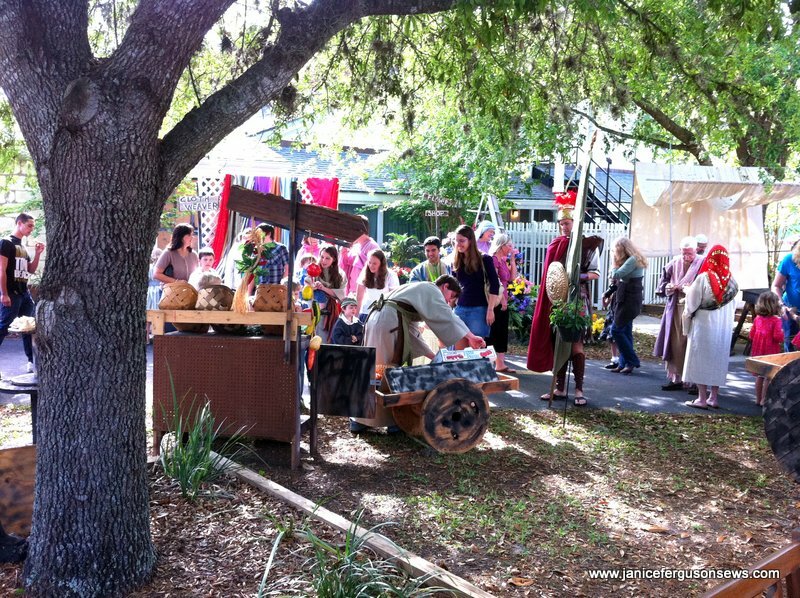 Your daughter-in-law is sure to appreciate this. B, the design has been sent. Happy stitching. Shirley, I thought about you as I was arranging this design and doing the research. I’m glad you like it. The design has been sent. Chere, I’m glad you liked the layout of this quote. The design has been sent. I also would love this design. Going to stitch it and donate for an auction for our school in northern Michigan. I would sure love that design. It would make a good Christmas gift for our choir director. Janice, this would be a great auction item. I hope it brings a good price. The design has been sent. Joan, the design has been sent. I’m sure your choir director would appreciate a gift of these words and your time. Pam, the design has been sent. Your very talented granddaughter will probably love it. Thanks for reading my blog. Judy, the design has been sent. Stitching this for your choir director is a great way to express your appreciation. Janice – as with all your designs, this one is just beautiful! May I have the words please? Jokingly – does this imply that if I can’t sing WELL, then I am not praying twice?? If so, I am in trouble! Just teasing! You are an inspiration to me and I’m sure so many others! THANKS! Judy, I certainly rest more than you do! With all your travel around the country taking care of your grandchildren and your parents, you aren’t sleeping in your own bed half as often as I do. And still you stitch beautiful projects one after another, at home or on the road. So I ask, do you ever just rest? Sharon, you make me laugh! Just keep on singing–let God do the counting. The design has been sent. Your friends Pat and Jim sound like a giving, loving couple. They certainly are deserving of a special expression of thanks for their efforts. The designs have been sent. Happy stitching, Jackie. This is perfect for a friend- choir director. I would love to have if it is not too late. Lovely saying. Sarah, the design has been sent. I hope your friend enjoys it. Janice, this saying is perfect for so many of my friends. 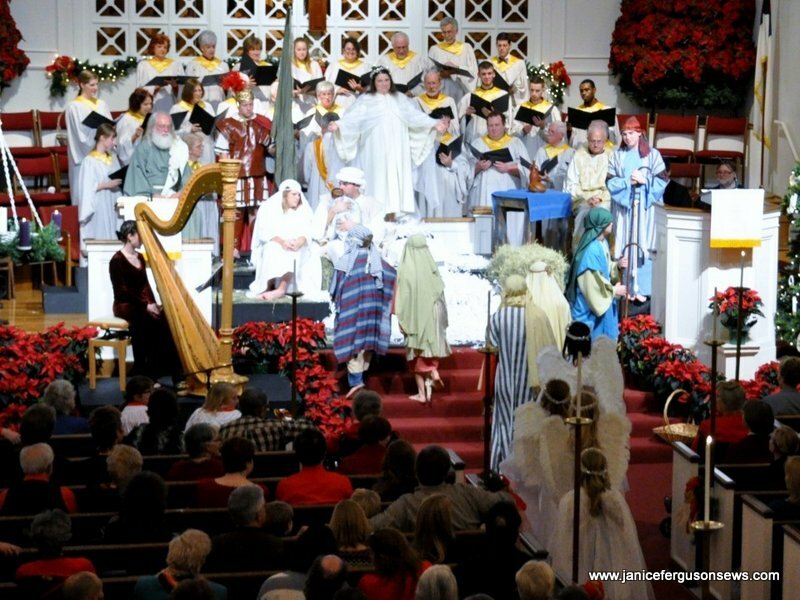 We belong to the Church of Christ which uses no instruments, just voice. I am not personally against worship with instruments but when you hear the beauty of the true voice it really can be breathtaking. I would like to use your design for one of my best friends who leads singing. Thanks for the offer of it. Rosie, the designs have been sent. The fact that the Church of Christ uses no instruments really interests me. I love learning about other Christian churches. I hope you find a good project for this text. sing at the school choir. Thank you, Frances. The designs have been sent. design and it would be perfect for a square if it is still available . Jeannette, the design has been sent. What a good time you will have making this quilt for your sister. Is this design text still available? I have been teaching for this quote to make for our choir director at church. Thanks for your hard work on this. Cindy, the design has been sent. I expect your choir director will be familiar with it and enjoy your gift. I would live to have the music design. Thanks. Bonnie, the design has been sent. I hope you enjoy stitching it.